To our surprise, we are heading to California for the Craft & Hobby Association Show in Anaheim, California. This show is known to the industry insiders as CHA. CHA is an organization that puts on 2 mega shows each year in the USA. It is not a show that is open to the public because it is a show where manufacturers , distributors, retailers, artists, authors and others come together to meet. Of the two shows they host, the Anaheim Show is the one not to miss if you are looking to meet important people behind the scenes. So what happens at this show? They host classes to teach people techniques and projects to retailers to be able to educate their customers. Companies looking to get exposure to get retailers to consider a purchase. Authors looking to get their books into more retailers and for them to meet & greet. This is definitely a buyer’s show. Retailers come and see the new products that are available. Retailers place their orders. Having been twice before, this show is way over the top in inspiration. The floor displays and booths are decked to the 9’s in look and presentation. It’s really quite amazing to be honest with you. This show has the power to make or break a product. Items we see at this show may never see the light of day if the idea isn’t accepted. In July 2011 at the CHA Show in Chicago. I seen a little 6 foot table with a husband and wife team. They were featuring the Rainbow Loom. At the time, it was called Twistz Bandz. I flipped out… Seriously flipped out. I thought immediately… this toy is going to be massive! Though many retailers walked right on pass them, I told everyone in my reach at this show that this toy is going to be huge. I was so impressed by Choon and his lovely wife. At the 2011 Awards Show at the end of the show, Choon Ng, inventor of Rainbow Loom was named the most innovative product of the show. Case in point, 2013 Christmas, this toy is the hottest toy / craft tool at Michaels Stores across North America! It’s shows like this where dreams can come true as this is where is can all begin. 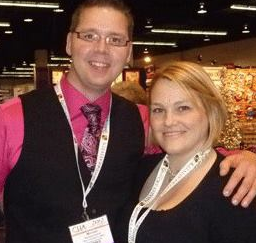 While at CHA, you fill find Diva Dan and I buzzing and having fun around the Red Heart Booth on January 11th and 12th. We rarely get to the United States and this is an opportunity to say hello in person. The icing on the cake is to meet back up with our very own Cathy! Cathy and I have only met 1 time in the past 5 years. We are scheduled to meet up in February in between The Crochet Cruises as she is from California. This surprise for us allows us to meet with Cathy and her family for a lovely dinner. We can gossip, share and laugh. Cathy is really important in Daniel and I’s lives. To put aside her role for us in our company, she is firstly a friend and someone who I can say ‘has my back’ when I am feeling up against a wall. A stranger, turned volunteer, turned executive assistant, turned into one of our best friends. To Daniel and I, she is part of our family… not business family, but our genuine extended family. Meeting Cathy in person is a rare opportunity and something we love. So if you work behind the scenes and are a member of CHA or planning to be a CHA, Diva Dan and I are hard to miss on the show floor. Be sure to stop by and say Hi. PS. Due to our schedule of flights and timing, we are flying in and flying directly out. Sadly, we don’t have enough time allowance to meet with our fans. This entry was posted in Announcements, Crafting Shows and tagged Anaheim California, California, CHA, Chicago, Christmas, Michael, Michael Sellick, Rainbow Loom, Red Heart, United States. Bookmark the permalink. What a great opportunity for you! Love the look of that bracelet in the video. Looks like it might be a little complicated and you’ll need a bit of patience to get to the finished product though. Such a wonderful opportunity for you three (Cathy,Dan and Mikey) ….have a fabulous time! BTW I have 2 Rainbow Looms for my daughters for Christmas……that I got at Michael’s! I’m sorry you won’t have time to meet with your fans (especially me). I live very close to Anaheim but I am not in CHA. I hope you have a wonderful time in California!